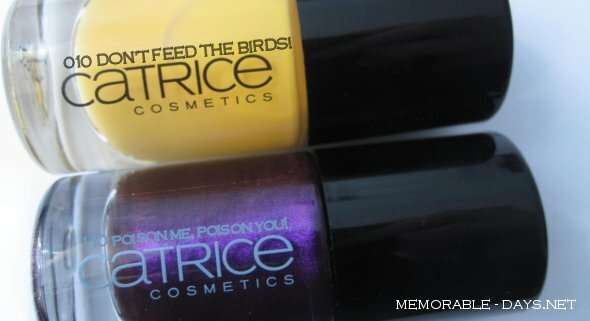 Catrice - Don't feed the birds & Poison me, Poison you! | Memorable Days : Beauty Blog - Korean Beauty, European, American Product Reviews. Catrice - Don't feed the birds & Poison me, Poison you! I bought two nail polishes of Catrice since they were on sale at a Dutch drugstore =). I love their nail polishes because of the colors and the good quality. I have been searching for a thick yellow nail polish for a while and I finally found one ^_^ which is the 010 Don't feed the birds nail polish. 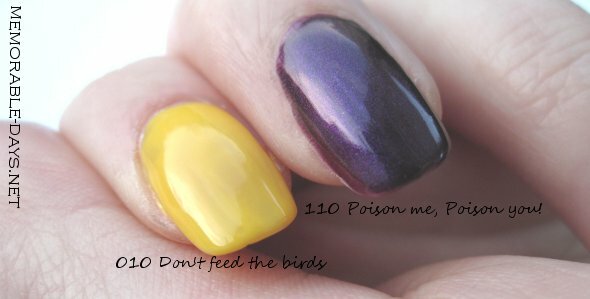 Apparently there are 2 different kinds of 010 Don't feed the birds nail polishes in their assortment. 010 is a yellow nail polish without shimmer, but I also saw that there is one with shimmer and they have the same product name. The purple one is called 110 Poison me, Poison you! I love the names of their polishes xD! It's a dark purple nail polish with shimmer. Very pretty ^__^! Bought these during sale for €1.25 each. Normal price is €2.49 each. Both nail polishes are thick, the purple one looks good with 1 coat and the yellow one needs 2 coats :). 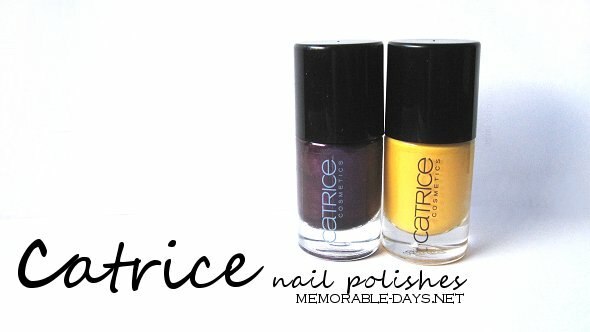 A new Catrice collection will be out soon with NEW Catrice nail polishes so I can't wait !!! I'm definitely going to buy more of these nail polishes =D they are great and not pricey at all! lovely! lol you blog so frequently elisa! @xlittle, hihi.. ga 'm gebruike voor nail art =D !! Oe die geel heb ik nog nooit gezien ;o.
that's a gorgeous yellow shade!